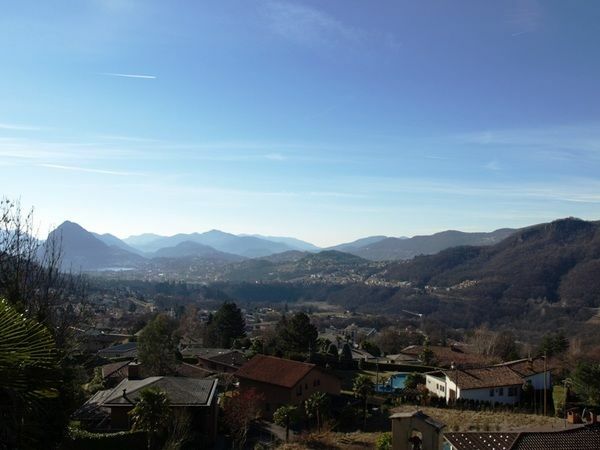 Beautiful building land in a very panoramic position with a splendid open and unobstructable view of the bay of Lugano and beyond, to the massif of Monte San Giorgio. The land faces south and is located in a quiet residential area on a side street with little traffic. The ARL bus stop is not far away and provides regular and convenient connections with Lugano. The beautiful land is sloping but easy to build and it is connected to electricity, telephone and sewerage systems. The total area is approx. 831 m2 (of which a part of approx. 125 m2 of woodland) and it is allowed to build approx. 353 m2 of maximum gross living area. In order to be able to follow the natural course of the land, a maximum height of up to 9 metres is permitted. Large stately villa situated in an elegant residential area, very quiet and with a beautiful open view, served by a small and safe street. The beautiful, completely flat land has an area of approx. 1'350 m2 and in the garden there is a charming stone infinity pool, awarded by a specialist magazine. The total living area is approx. 470 m2. The villa consists of: entrance hall, large living room divided by a charming fireplace open on the sides, large eat-in kitchen, beautiful terrace overlooking the garden, master bedroom with wardrobe and beautiful en-suite bathroom, other 4 bedrooms, 3 bathrooms, lovely reading corner, 2 rooms available (hobby, guests, etc. ), laundry, cellars and technical rooms. Two-room apartment with separate entrance, large garage for 4-5 cars and 2 outdoor parking spaces. 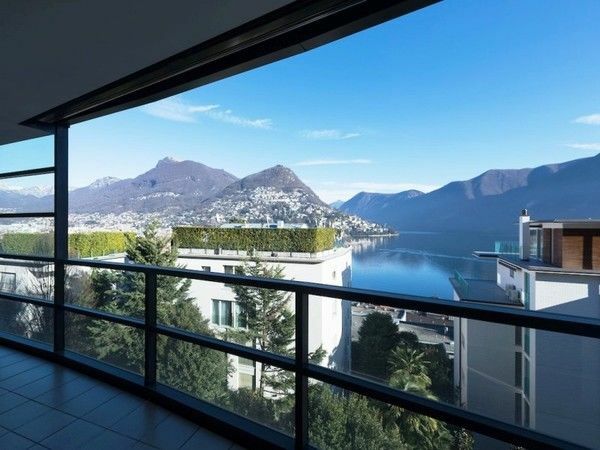 Beautiful new apartments with magnificent lake view located in Montagnola, one of the most exclusive residential areas around Lugano. 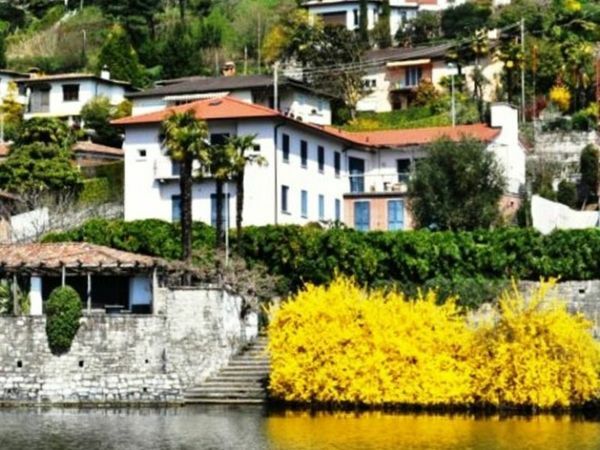 The small residence of only 5 apartments (all available as a secondary residence) is located in a very quiet area surrounded by greenery and offers a beautiful panoramic view of the lake, the bay of Agno and the mountains of Malcantone. 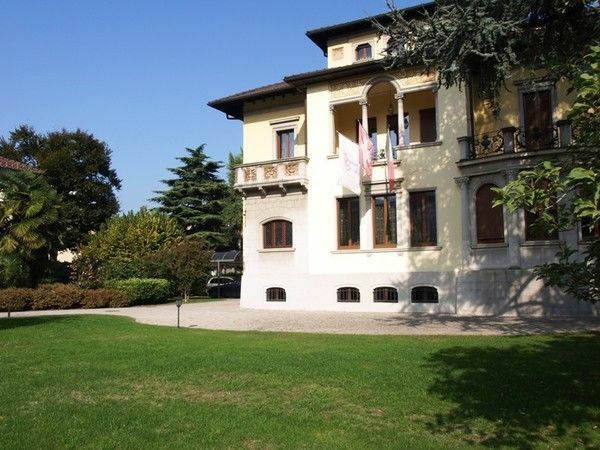 The original building has been completely renovated with elegance and attention to detail in all its components and is surrounded by a beautiful park. Large terraces and balconies, bright rooms and accurate finishes characterize this beautiful property. The 4 apartments for sale have cuts from 1,5 to 4,5 rooms with living areas ranging from approx. 43 m2 to approx. 137 m2. The penthouse has also a private garden of approx. 200 m2. 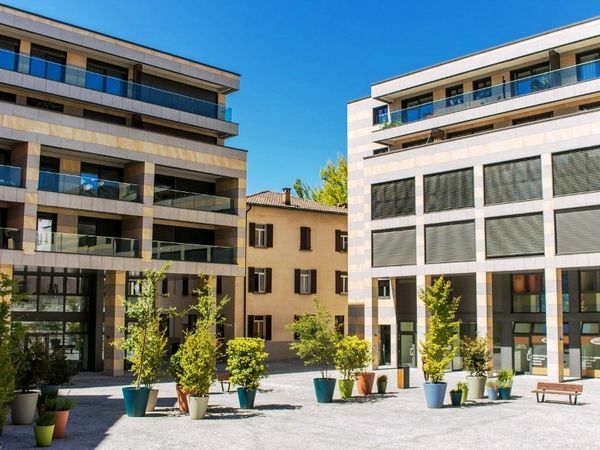 Splendid and bright duplex apartment with magnificent lake view a stone's throw from via Nassa (it can also be purchased as a secondary residence). All the infrastructure and public services are within easy reach and in a few minutes’ walk you reach the lakeside promenade, the city center and the train station. The apartment has a living area of approx. 160 m2 with 2 beautiful panoramic terraces for a further approx. 24 m2. On one floor we find the entrance with wardrobe and guest WC, the bright living room with access to the beautiful panoramic terrace and the well equipped kitchen. Connected by a comfortable staircase we have the area with the 3 bedrooms, a bathroom with shower, a bathroom with bathtub, a practical storage room and the private laundry room. Luxurious finishes, resin floors, air conditioning and central sound system are some of the features of this exclusive apartment. Spacious semi-detached villa in a very sunny residential area with beautiful open views and large flat land. 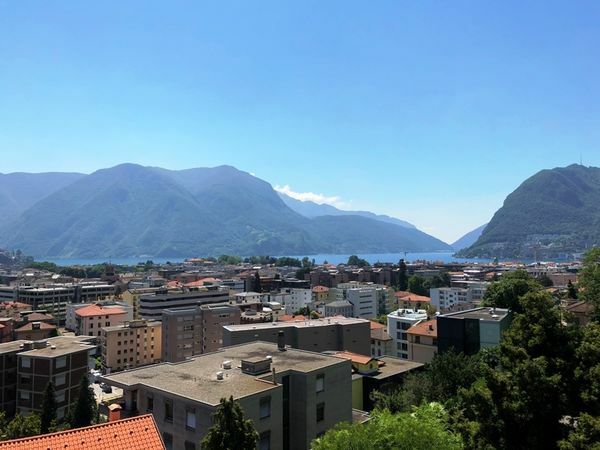 It is located in a convenient location to reach the center of Lugano and the motorway access and close to public transport. The lovely property is in good condition and has a 3,5 room apartment with independent access but already connected internally: an interesting solution also as a home with professional studio. It offers enough space for the whole family (also suitable as a generation house or yield property) and leaves all possibilities open for future projects. The living area is approx. 240 m2 plus approx. 210 m2 of service rooms (“grottino” with fireplace, large cellars, hobby rooms, sauna, spacious laundry, etc.). The approx. 1’281 m2 plot of land is also suitable for a possible parcelling and therefore for the construction of a second home (or other solutions). The property is completed by the romantic and spacious covered porch with fireplace, the beautiful flat and well-kept garden, covered parking for 3 cars. 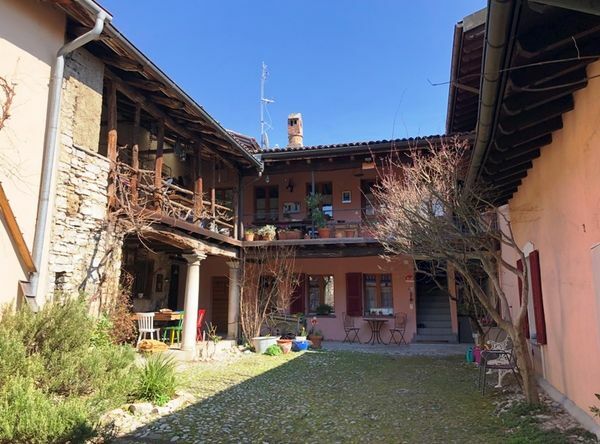 Beautiful typical and charming Ticino-house with romantic courtyard located in the historic center of Meride, one of the most delightful and characteristic villages of Mendrisiotto. The living area is currently approx. 224 m2 in addition there are approx. 206 m2 of additional rooms, partially convertible spaces for residential use. The beautiful inner courtyard of approx. 115 m2 is accessed through a large portal facing the small main street of the village and a part of the property (left in the "rustic" state) serves as a practical garage for 1-2 cars. Currently the property is divided into three apartments for B & B use but could easily be used as a primary home for one or two families. Beautiful two-family house with beautiful panoramic views and outdoor pool, set in a quiet and peaceful residential area just 10 minutes from the highway entrance of Manno. The view is wonderful and ranges fan-shaped from Val Colla, passing through Lake Lugano to the massif of Monte Generoso. The generous house is located on a plot of land of approx. 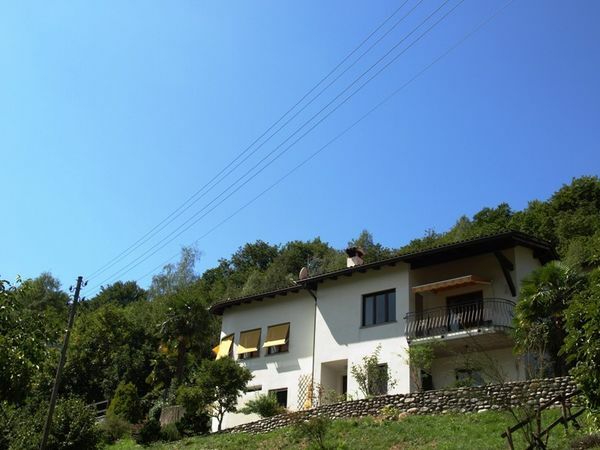 1'900 m2 (partly woodland) and consists of 2 apartments: a 5,5-room apartment with a living area of approx. 200 m2 and with a beautiful living /dining area with a particular double height ceiling and a 3,5-room apartment of approx. 75 m2 with a lovely panoramic terrace. In the well-kept garden there is a beautiful swimming pool and a vegetable garden. Garage for 3 cars and 4 outdoor parking spaces. 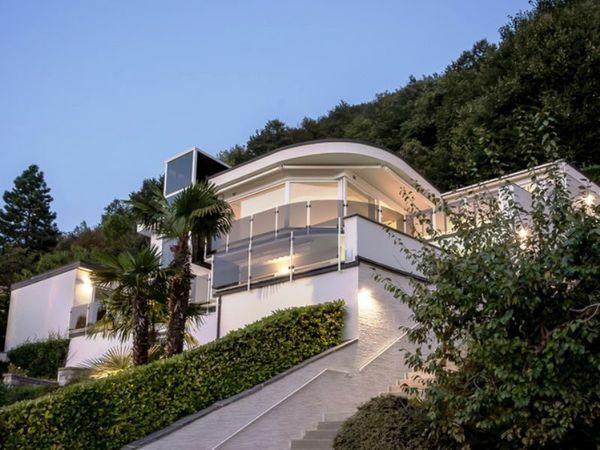 Wonderful villa located in a panoramic and very sunny position, with beautiful views upon the bay of Lugano and the surrounding hills. The living area is approx. 422 m2 in addition there are approx. 65 m2 of service rooms. The villa has a 2,5 room apartment with separate entrance, ideal as guest apartment, studio or for the staff. The villa consists of: elegant entrance area, large and beautiful living room with fireplace and TV corner, dining area, modern and very well equipped kitchen, marvellous patio, master bedroom with dressing area and en-suite bathroom, 3-4 more spacious bedrooms with 2 bathrooms, guest bathroom, fitness room with sauna, large laundry, cellar and technical rooms. Four parking lots in the garage and one outdoor parking space. 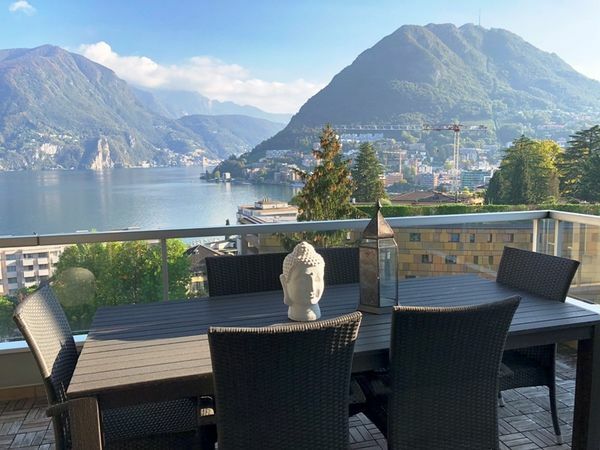 Bright and elegant 4.5 room duplex apartment in a magnificent dominant position, with a splendid view of the lake, the bay of Lugano and the surrounding mountains. The magnificent apartment is luxuriously finished with high-end finishes and is set in an exclusive residence of 18 apartments with an indoor swimming pool, fitness area with sauna. The living area is approx. 172 m2 divided on 2 floors and joined by an internal staircase while the beautiful terraces and the lovely private garden have a total area of approx. 120 m2. Upstairs is the living area with living-dining room, fully equipped kitchen, guest toilet and access to the panoramic terrace and the nice private garden. Downstairs there are 3 bedrooms each with en-suite bathroom, a comfortable closet room and the second beautiful terrace with garden. Cellar and 2 parking spaces in the garage. 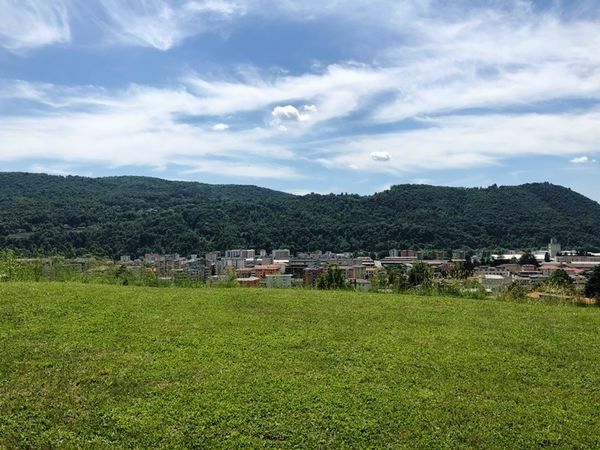 Two beautiful contiguous, south-facing building plots in a panoramic position with an open view, lots of light and lots of sun. The plots are located in a privileged residential area on a quiet side street. Nearby are schools, shopping centers and all major services. Both areas are about half flat, easy to build and already connected to the gas, electricity and sewerage networks. They are located in the area so called RE of the Residential Master Plan with an occupancy index IO of 30% and an exploitation index IS of 0.4. The first has a total surface area of approx. 767 m2 with a maximum gross usable area (SUL) of approx. 349 m2, the second is approx. 985 m2 with a maximum SUL of approx. 436 m2. You can also buy both plots for an attractive real estate promotion. 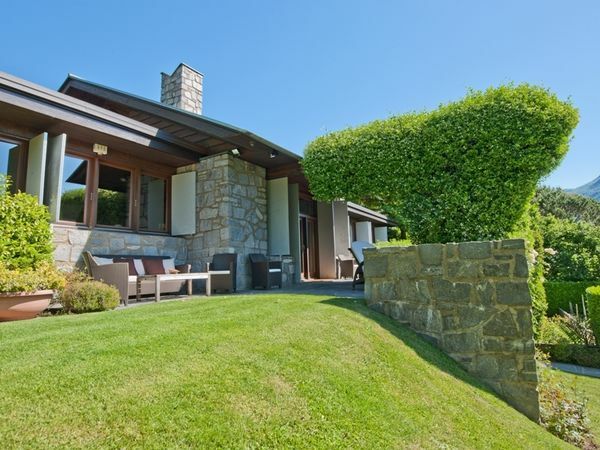 Built in a modern and elegant style on a plot of about 1’456 m2, the villa is southwest oriented and, due to the slight inclination of the ground towards the lake, the position grants breathtaking views in full sun. It has a total living space of about 520 m2 and also a private plot of about 142 m2 right at the lakefront. The villa consists of: entrance area with cloakroom, large (60 m2) and beautiful living room with fireplace, dining room, kitchen with pantry, lovely terrace covered with wisterias, 5 bedrooms, 3 bathrooms, walk-in closet, sauna, laundry, several cellars and service rooms. 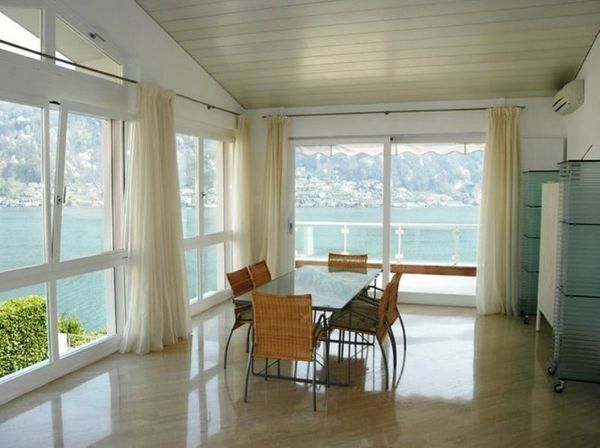 Elegant and spacious 4.5 room apartment with a wonderful view of the lake and the beautiful surrounding mountains. The apartment occupies an entire floor of a pretty small building and is carefully finished. Subject to tasteful renovation at the highest level in 2016, it is in perfect condition. The bus stop that leads comfortably in the city center is only 50 meters away. This splendid apartment has a living area of approx. 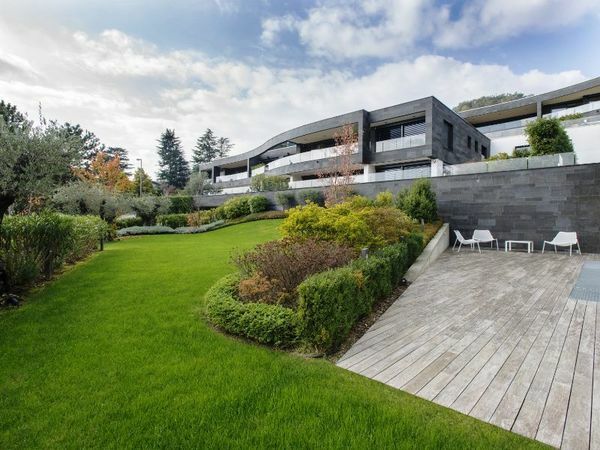 192 m2, two beautiful panoramic terraces of approx. 18 m2, a nice private garden and an additional terrace/patio of approx. 100 m2. It consists of: entrance area with wardrobe, large living room, dining room, modern well-equipped kitchen, 3 bedrooms and 3 bathrooms (one with a washer-dryer column). Numerous fitted wardrobes, 2 cellars and 2 indoor parking spaces complete the property. 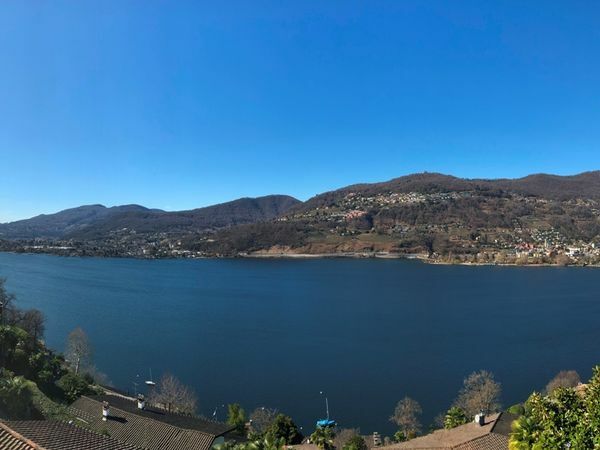 Spacious semi-detached property with a magnificent lake view, inserted in the picturesque village of Albonago sul Brè in a very quiet area with lots of sun. The city can be reached in a few minutes and the view sweeps free on the lake, the city and the beautiful surrounding mountains. The building is spread over 3 floors connected by a lift, is currently divided into 3 units (2 adjoining villas and a penthouse) but is easily convertible into a large single-family house. The total living area is approx. 468 m2 in addition to approx. 105 m2 of service rooms and approx. 205 m2 of terraces and balconies. The beautiful plot has a size of approx. 1’118 m2. The finishes are elegant with pear wood windows, automated blinds, air conditioning, etc. The first villa has a living area of approx. 169 m2, the surface of the second villa is approx. 211 m2 while the penthouse is approx. 88 m2. The property is surrounded by a beautiful, well-kept garden. Elegant villa with beautiful swimming pool, located in an exclusive and sunny residential area, on a small and quiet access road. Stabio is a well-connected town with all easily accessible major services. The living area of this wonderful home is about 250 m2 and the flat plot has a size of 1’506 m2. The villa consists of: pretty entrance area with coat closet, spacious living room with marble fireplace, large windows and access to the large porch located in front of the swimming pool, well equipped eat-in kitchen, 4 bedrooms (2 with access to a beautiful terrace), 3 bathrooms, hobby room, cellar, laundry, technical room and useful storeroom. Beautiful and bright floors, partly in Verona marble. Flat and nicely planted garden with much privacy, heatable swimming pool, lovely pergola, garden shed, garage for 3 cars and parking lots in the forecourt. Large building plot of approx. 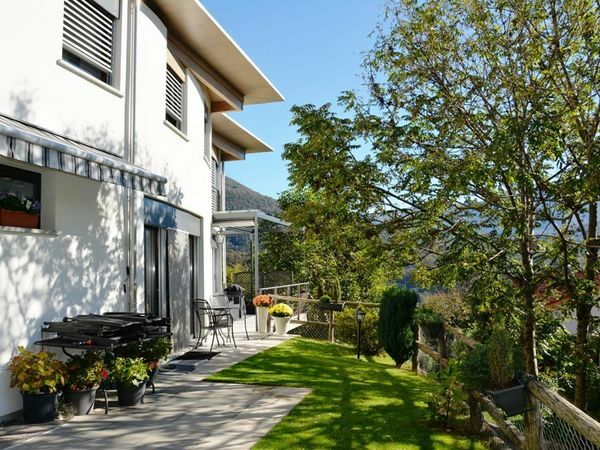 1’189 m2 with beautiful views of the surrounding valleys and mountains. The land is located on a dead-end street in a quiet residential area and it is facing south, towards the sun. 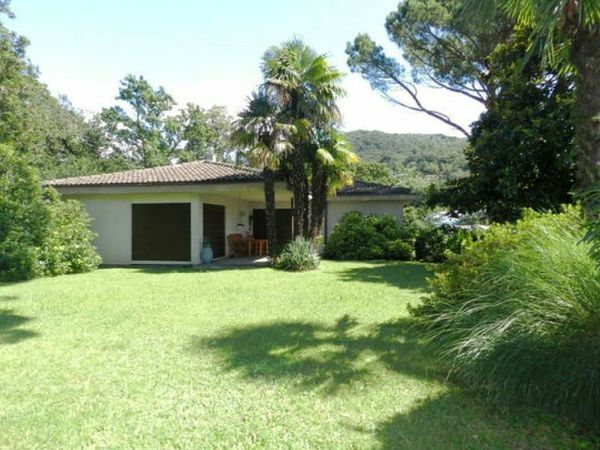 In a few minutes you can reach Lake Lugano, the Magliaso golf course and the convenient Lugano-Ponte Tresa train. The parcel is connected to the sewerage network and the electricity distribution network. The maximum living area (SUL) permitted by the Zone Plan is approx. 594 m2. 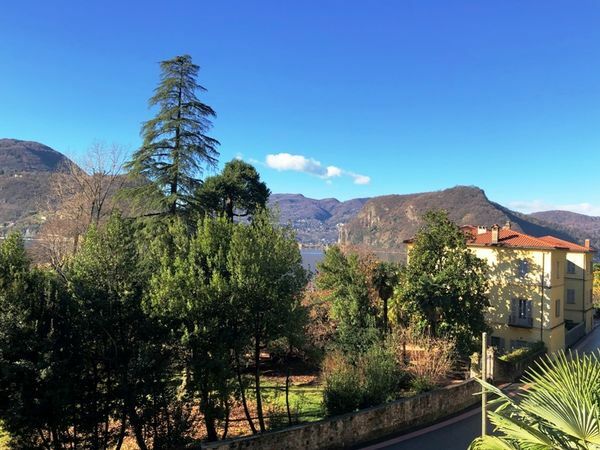 Bright apartment of 4.5 rooms with beautiful private garden, located in an elegant condominium in a strategic position, with a beautiful view of Monte Brè, the city and partially on the lake. This lovely apartment is located in a residential area under the Ospedale Civico with public amenities and facilities at a sort distance (bus stop in front of the house). The living area is approx. 157 m2 with a large terrace of approx. 70 m2 and the private garden measures approx. 100 m2. It consists of: entrance hall with wardrobe and guest service, large living room, dining area, fully equipped kitchen, 3 bedrooms, bathroom with bathtub and bathroom with shower. All rooms have a comfortable height of approx. 2.7 meters. From the living room and the bedrooms you can access the terrace and garden. Accurate finishes with travertine and parquet floors, underfloor heating, thermo-lacquered metal frames, electric blinds and sun awnings. 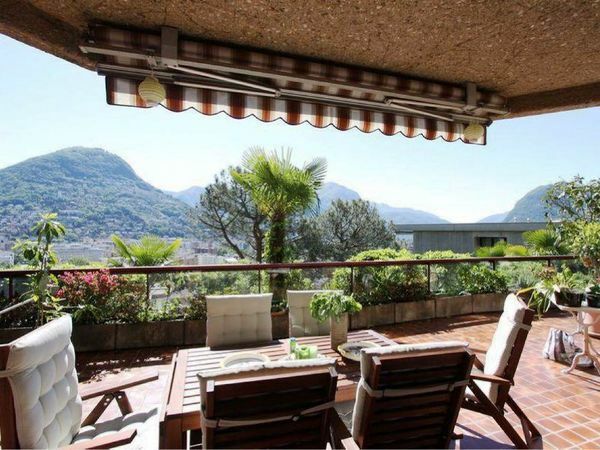 Cozy villa in traditional style with a splendid panoramic view of Lugano, the lake and the surrounding mountains. The living area is approx. 250 m2 plus approx. 100 m2 of space for additional rooms (laundry, cellars, etc.) and porches and balconies of approx. 36 m2. The land follows the natural shape of the hill with an area of approx. 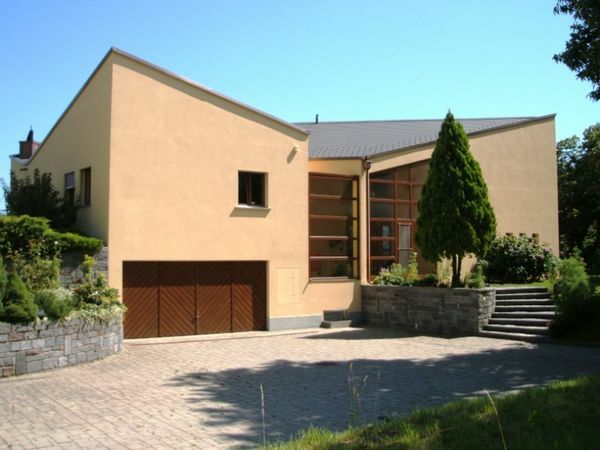 1’060 m2 and houses a beautiful outdoor swimming pool. The villa consists of: generous entrance hall with wardrobe, cozy living room with fireplace and access to the covered terrace, separate dining area, fully equipped kitchen, pantry/bar, beautiful granite pergola, master bedroom with large wardrobe room (evtl. fourth bedroom) and en-suite bathroom with shower and bath, another 2 spacious bedrooms, 2 bathrooms with shower, hobby room, spacious laundry room, large wine cellar/storage and shelter/cellar. Large internal garage for two cars and bikes and 3 outdoor parking spaces. 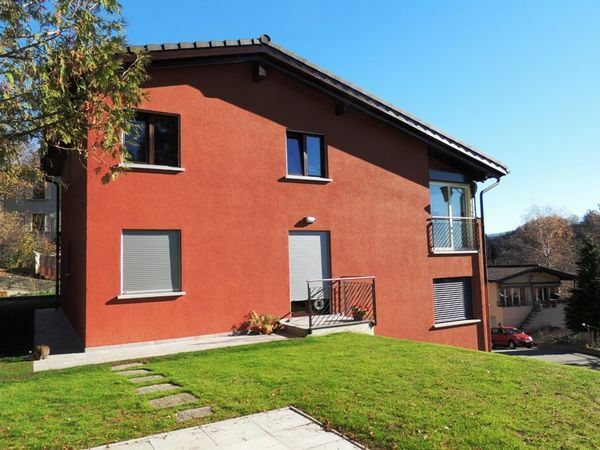 Beautiful, modern and comfortable home located in a quiet and very sunny residential neighbourhood, with open distant views. Situated at the borders of the old and picturesque village center, this charming house is located at a short distance to the bus stop and the kinder garden. The living area is approx. 200 m2 and the total area of the plot is approx. 450 m2. 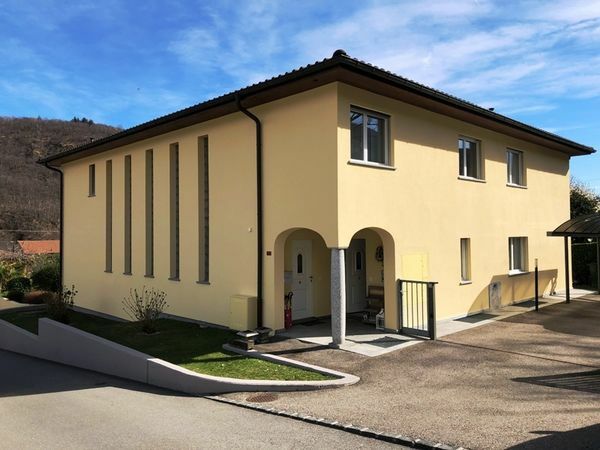 It consits of: entry area with guest bathroom, beautiful living room, dining area, modern and well equipped kitchen (ZUG), spacious terrace, master bedroom with built in wardrobes and en-suite bathroom, 3 more bedrooms with 2 bathrooms, large storeroom/guest room and laundry. Harmonious garden with lovely lawn, 2 covered and 2 outdoor parking spaces. 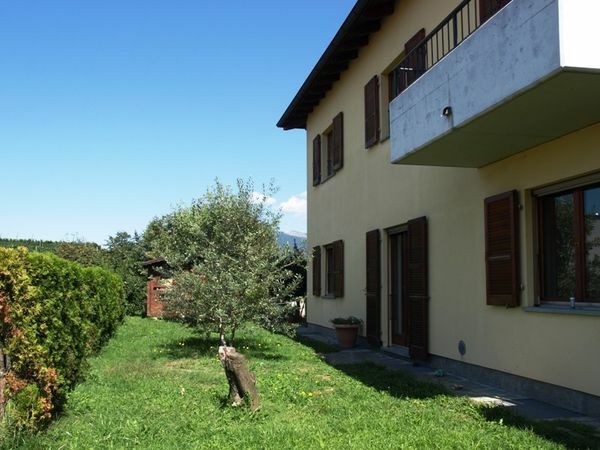 Beautiful and spacious two-family house with well-kept garden located in a quiet and sunny residential area, with open views of the picturesque village of Arosio and the magnificent mountains of Malcantone. The house was elegantly renovated in 2014 with great attention to detail and has 2 apartments of 4,5 and 3,5 rooms (both with master bedrooms with en-suite bathrooms) as well as a studio apartment. There are 3 parking spaces in the garage and there are also 6 comfortable outdoor parking spaces. Currently the beautiful house is lived as a two-family house but could be easily converted into a spacious single-family house, perfect for a large family. By the way, for those who want to reduce mortgage, renting one of the apartments could be an ideal solution! 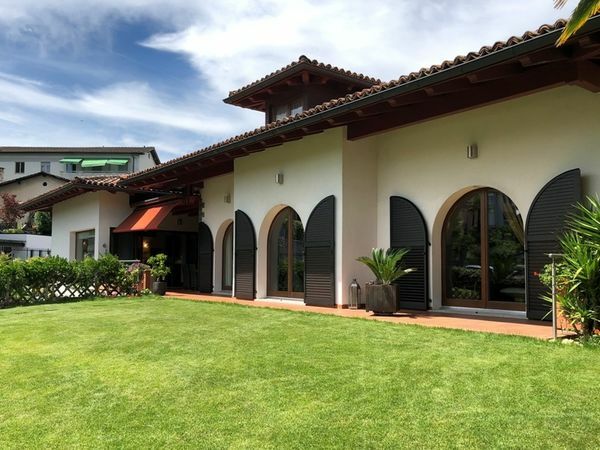 Large and elegant villa with splendid lake view, inserted as a precious gem among the hills overlooking Lugano and located in a residential neighborhood of exclusive villas, on a dead-end street with very little traffic. 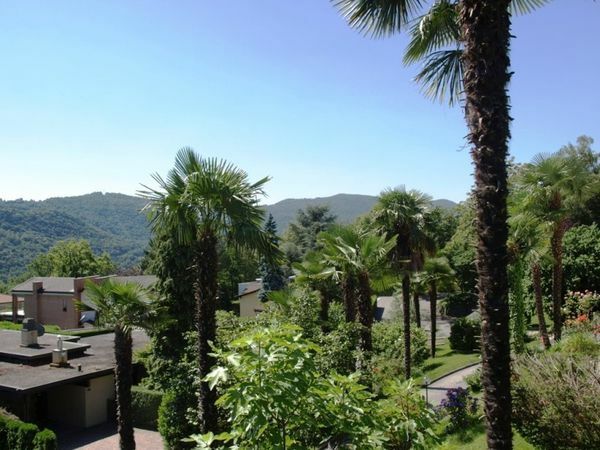 The location is very quiet and sunny and from the prestigious villa the view is fan-shaped on the beautiful surrounding mountains, Lake Lugano and the beautiful and well-kept garden. The living area is approx. 908 m2 in addition to approx. 420 m2 of additional rooms and the beautiful plot measures approx. 2’161 m2. The finishes are classic and high standing, with fine parquet and marble, antique interior doors, bathrooms with exquisite and refined decorative elements and many other exclusive details, both inside and outside the villa. The spaces are ample and generous and reflect the prestige of this magnificent property. 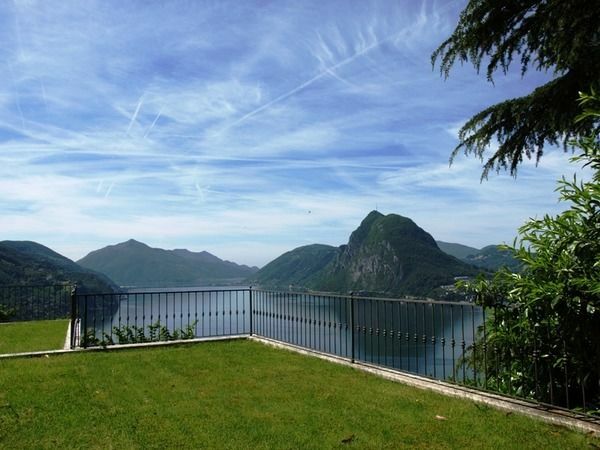 Large property in wonderful, exclusive and dominant location, with breathtaking views upon the lake, the bay of Lugano and the surrounding mountains. 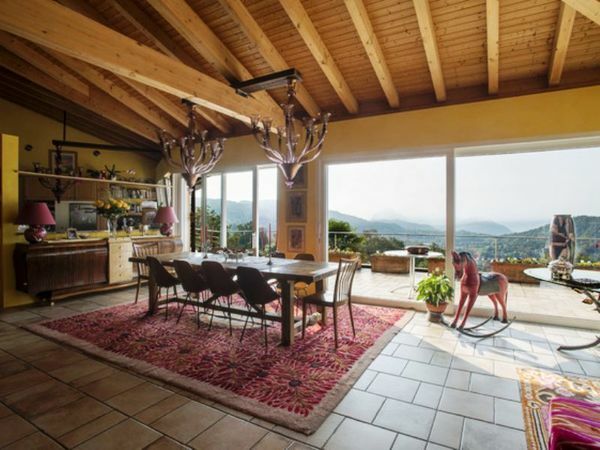 The villa is located in an elevated position and towers over the hill above Castagnola in one of the most beautiful locations of the whole area. The buildout capability allow an additional enlargement and this would make it one of the most fantastic properties of the hill of Monte Brè. The plot has a size of about 2’100 m2, the living area is about 1’300 m2 and consists of : living rooms, library, two kitchens, several bedrooms, staff rooms, large winter garden of about 300 m2 now used as exhibition space, home theater, big fitness area (gym, sauna, steam bath, whirlpool, Kneipp baths, etc.) and many other rooms (storage, cellars, technical rooms). To the property belong two garages and six outdoor parking lots. Nice and cozy single-family house just a few steps from the lake and with beautiful open views. It is situated in a slightly elevated and sunny position, a short distance from the Lido di Figino, the communal port and the bus stop. This building is part of a complex of 7 houses, with underground garage and shared elevator. The house is spread over 3 floors with a living area of approx. 162 m2 plus approx. 24 m2 of service rooms and covered porches of approx. 21 m2. It consists of: atrium with wardrobe and guest toilet, living room with fireplace and dining area, nice equipped kitchen, lovely porches, 4 bedrooms, cloakroom, 2 bathrooms, laundry/technical room, wine cellar/storage room and a cellar. Private garden of approx. 120 m2 and 2 parking spaces in the garage. 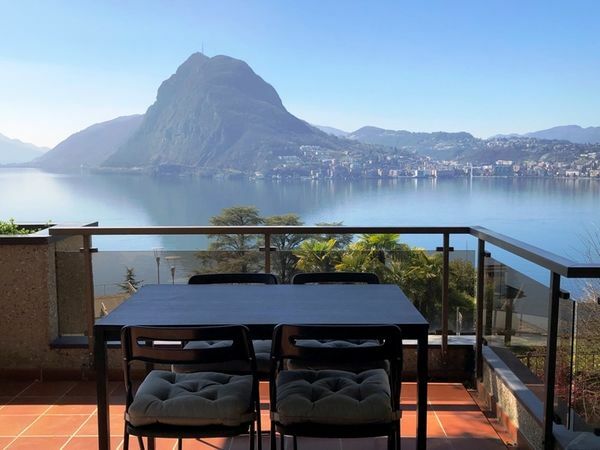 Cozy and comfortable villa in a splendid panoramic position with a magnificent panoramic view of the lake, the mountains and the hills surrounding Lugano. The property is located in a quiet and sunny residential area of beautiful villas, on a small dead-end road. The land has a size of almost 1'900 m2 and the living area of the villa is approx. 300 m2 in addition to approx. 177 m2 of service rooms. The villa is divided as follows: entrance hall with wardrobe, living room with fireplace and dining area with double height ceiling, fully equipped kitchen, beautiful terrace surrounding the pool, 4 bedrooms, study/library on a gallery, 4 bathrooms, 2 guest bathrooms, cloakroom, laundry, cellar, storage rooms and technical room. In the large and well-kept garden, we find the heated swimming pool (10 x 4.5 m), a romantic 2-storey house (Rustico) with fireplace and already prepared for a renovation and the tool shed. Elegant and spacious Mediterranean-style villa located in a stately residential area on the edge of the historic centre of Stabio. The living area of this beautiful property is approx. 450 m2 and can be lived as a single-family home or as a duplex house. The well-kept and large flat terrain has a total surface area of approx. 2’200 m2. The villa consists of: entrance hall with guest bathroom and wardrobe, living room with large fireplace, dining room, very spacious equipped kitchen, large porches on the two main floors, 5/6 bedrooms, 2 balconies, guest apartment with fireplace, grottino with fireplace, spacious laundry/ironing room, cellar, shelter/depot, storage room and technical room. Large garage for 4 cars and yard with numerous outdoor parking spaces. Large and luxurious city villa in a strategically ideal location, within walking distance of all major services (schools, public transport, shops, etc.) and from which in a short time you can reach both the city center and the highway, the station and the airport. The 2008 building is on two levels and has a living area of approx. 305 m2 in addition to approx. 75 m2 of service rooms. The beautiful flat land measures approx. 871 m2. The finishings are elegant with beautiful floors of fine marble, video door entry system, central vacuum cleaner and automatic irrigation. The villa consists of: entrance hall with wardrobe, large living room with fireplace and dining area, beautiful porch, fully equipped kitchen, 4 bedrooms, 2 guest toilets, 3 bathrooms, another living room/grottino with fireplace, second kitchen, fitness room with Jacuzzi and sauna (evtl. fifth room), large laundry/ironing room and walk-in wardrobe for seasonal clothing change. 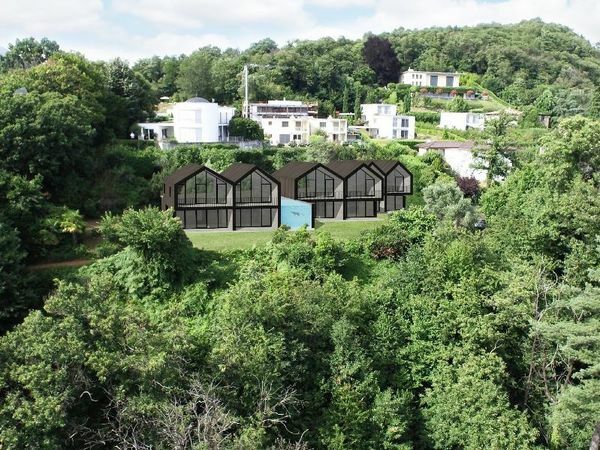 Valuable building plot of about 1'040 m2 located in an exclusive residential area of the wonderful Collina d’Oro and with the American School TASIS within a short walking distance. It is a beautiful plot, almost flat (therefore easily buildable), with wide and open views and with an already issued building licence for a gorgeous, modern villa. The plot allows the building of a living area of about 520 m2 and the maximum building height is 12,5 meters (3 floors). The property is completed by two almost unobtainable parking spaces in the internal automated gararage. Bright 3.5 room apartment with beautiful and unobstructable panoramic lake view. Located on the upper floors of the elegant Residenza Majestic, the apartment has all the services and infrastructure of public utility at a short distance. The lakeside promenade, the city center and the railway station are within easy walking distance. The living area is approx. 100 m2 in addition to 2 beautiful terraces of approx. 21 m2. It consists of: entrance hall, living room with dining area, open equipped kitchen, beautiful terrace with lake view, master bedroom with en-suite bathroom and a second bedroom with its own bathroom and a balcony. Quality finishes with insulating windows, electric blinds and awnings and air conditioning. The apartment has a cellar and a parking lot in the garage. Beautiful building land of approx. 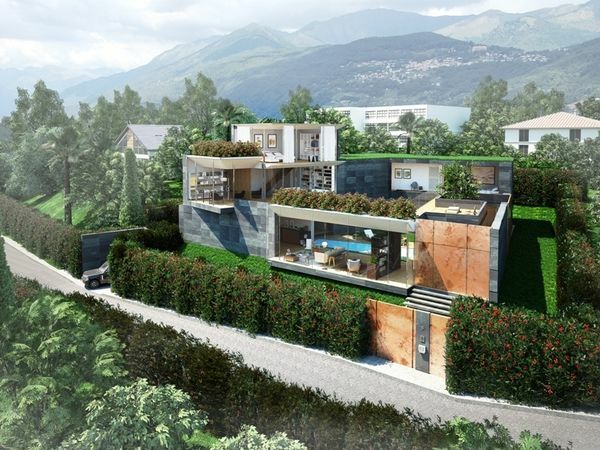 751 m2 (project of construction already approved) with lovely views of the lake and surrounding mountains. The project involves the "turnkey" construction of two lovely Minergie P standard homes located at the end of a quiet little street near the central area of the picturesque village of Pura, in an elevated position and facing south towards the sun. 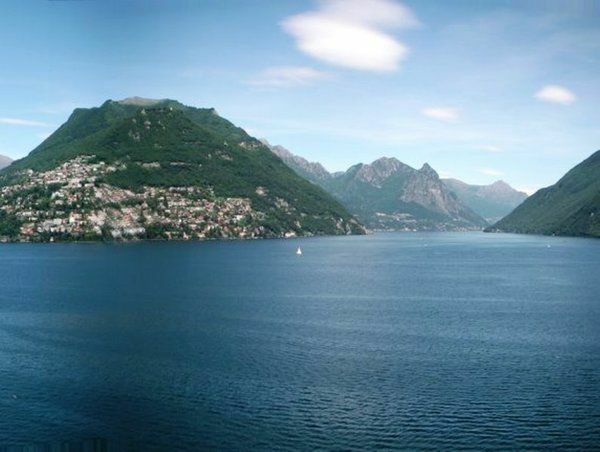 In a few minutes you can reach Lake Lugano, the golf course of Magliaso and the comfortable Lugano-Ponte Tresa train. Construction costs have been calculated and the offers of the artisans are already defined. The total living area will be approx. 369 m2 with approx. 64 m2 of additional spaces and a total volume of approx. 1’824 m3. 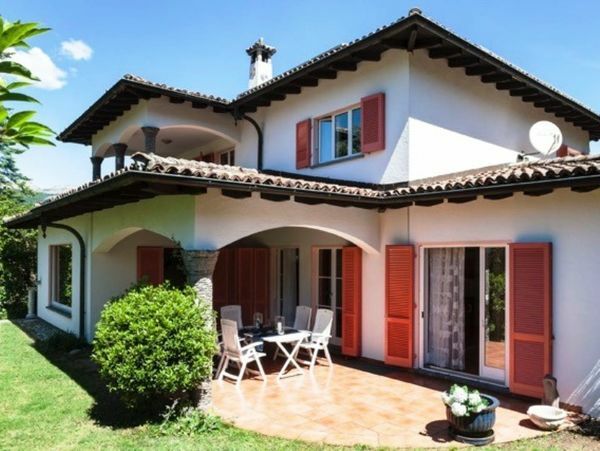 Charming villa in the green, located on the edge of the picturesque historic center of Ponte Capriasca in a quiet and sunny area, with plenty of privacy. 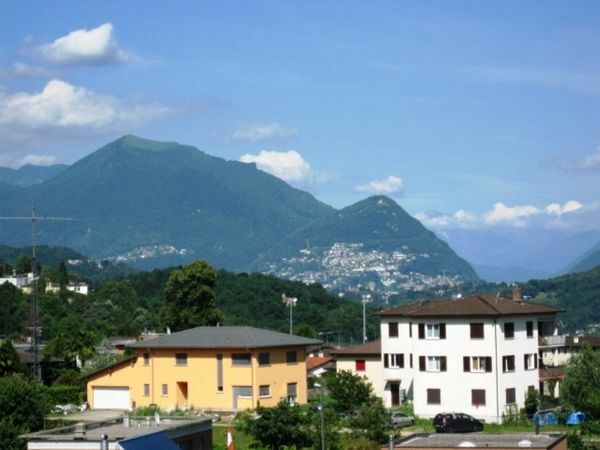 The centres of Lugano and Tesserete can be reached in a short time. The living area is approx. 182 m2 to which are to be added approx. 26 m2 of service rooms. The total size of the flat land is approx. 995 m2. The villa consists of: entrance hall with wardrobe and guest toilet, living room with fireplace, dining area, a study-library-reading area, fully equipped kitchen, two cosy winter gardens (one of which is heated) to expand the livable indoor area, master bedroom with en-suite bathroom, two other bedrooms, a bathroom, two multipurpose rooms (fitness, seasonal clothes change, etc. ), laundry, cellar and technical room. Covered parking place and outdoor parkings. 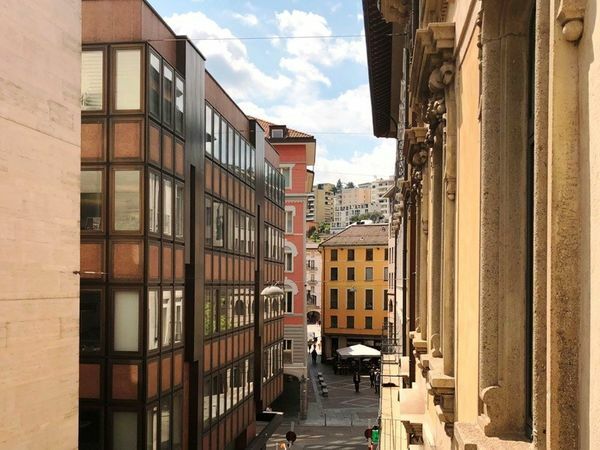 Two modern apartments of 2,5 rooms of high standing located in a very convenient position, just a few steps from the main services (railway station, bus stop, schools, highway access ...) and from the center of Lugano, which can be easily reached on foot. The new Residenza Santa Lucia, built in 2015, overlooks a bright pedestrian square, in the historic heart of Massagno. The beautiful finishes are of high standing and the modern heating system offers thermal comfort above the norm. The dimensions differ slightly (approx.. 71.5 m2 and approx.. 69 m2) and both apartments have a nice balcony of approx. 12.7 m2 and approx. 15 m2 respectively. They consist of: entrance area, living room with dining area, equipped open space kitchen, bedroom, large bathroom with bathtub and a beautiful balcony/terrace. Each apartment is combined with a practical cellar and it is possible to buy a parking space in the garage. 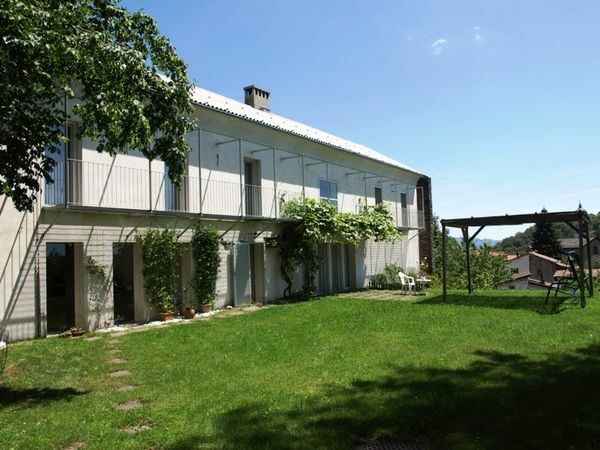 Romantic property surrounded by old trees and with direct private access to the lake. 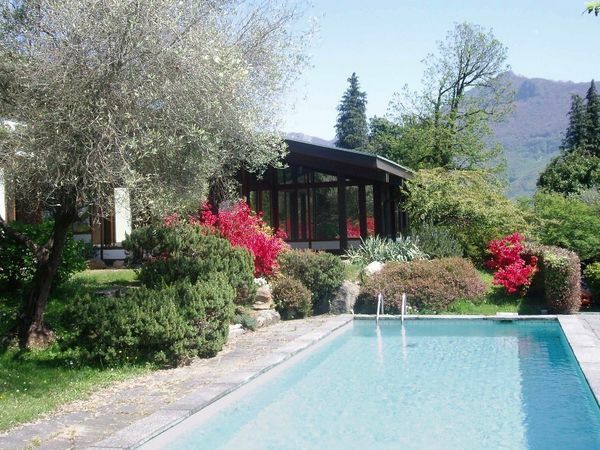 The villa is located in an exclusive and very sunny area just a few meters from Lake Lugano and it has a private shore. The position is very convenient, public transportation is close-by and in the proximity you have a golf course, the lido/bathing beach, the schools and some shops. The building has been completely restored in 1993 and is in very good conditions. The living area is about 360 m2 and it can be extended for about additional 340 m2. The marvellous plot has a total size of over 2’500 m2. The villa consists of: spacious entrance area, large living room with fireplace, lovely dining area, equipped kitchen, living room/study, verandah and terrace, master bedroom, five more bedroom, five bathrooms, guest bathroom, kitchenette, technical and service rooms, garage for one car and three outdoor parking lots. The apartment with a living area of about 310 m2 split on two floors has a private garden of about 510 m2 with Mediterranean plants and old Tuscan olive trees. Lovely house located in an elevated position just before the village, in a quiet and sunny residential area away from the traffic and with wonderful panoramic views. The house consists of: spacious entrance area with winter garden, pretty living room with a fireplace, open and well equipped kitchen, 3 bedrooms, additional room/study, panoramic balcony, two bathrooms, spacious laundry and cellar. In the garden there is a nice porch with a pergola and an compound for pets. Two outdoor parking lots close to the house complete the property. 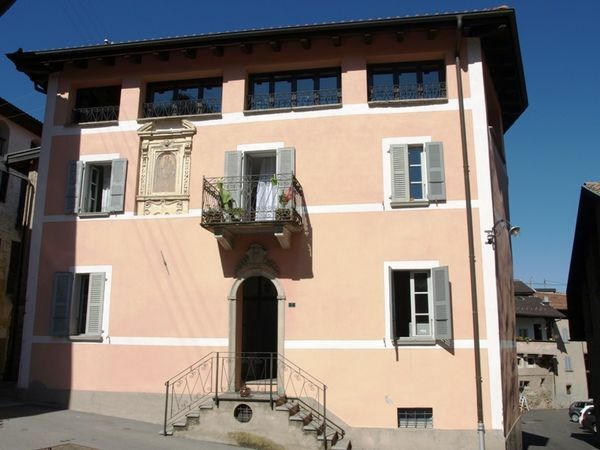 Large, characteristic and charming Ticinese house, completely restored and located on the border of the picturesque center of Carona, a lovely village situated above Lake Lugano. The view goes unobstructed onto the mountains and the roofs of the village. The living area of this building is about 300 m2 plus about other 60 m2 of service spaces located in the basement. Currently the house is divided into two apartments but they can be easily joined in order to create a single-family house. It consists of: large living room with panoramic windows and fireplace and antique oven, equipped kitchen, three bedrooms, large bathroom with tub and shower, guest-bath and wrought-iron balcony. Three-room apartment with living-room/kitchen with large Ticinese fireplace, two bedrooms (one with a fireplace) and a spacious bathroom with tub and shower. Beautiful plot of land in high and dominant position in the countryside and located in an exclusive residential area. The location is very sunny and quiet and there is a little private wood that belongs to the property. Close by there is the small Lake Origlio, where you can take peaceful walks surrounded by nature. 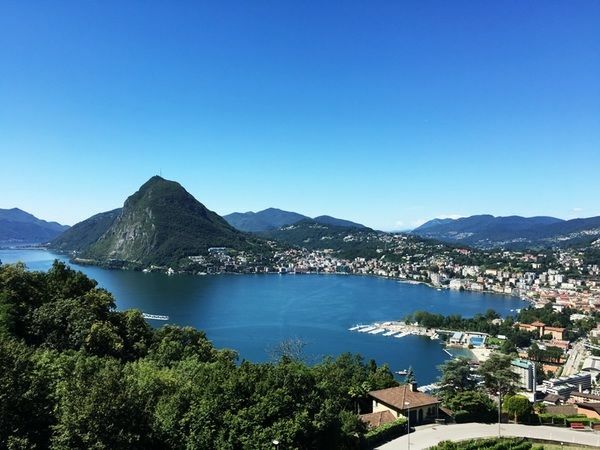 In the proximity there are all major service suppliers and Lugano can be reached in just 10 minutes by car. The total area of the plot is approx. 3’292 m2 of which approx. 1’264 m2 are registered as forestal area. According to the zone plan area building regulation it is possible to build a maximum gross living area of approx. 515 m2. On the plot, there is a house with a living area of approx. 230 m2 that can be either renovated, enlarged or demolished. 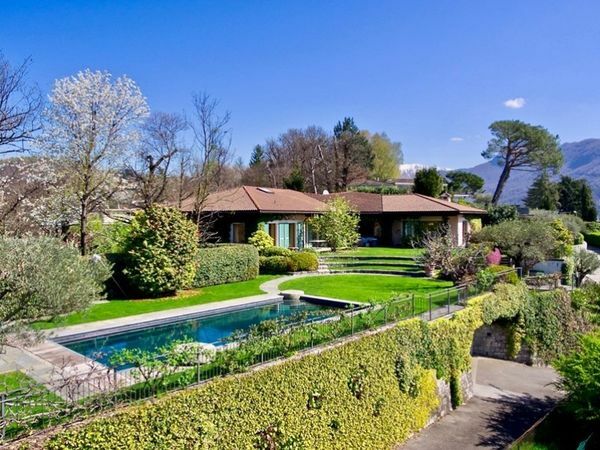 Spacious charming villa in classic style with beautiful indoor swimming pool, located in one of the most exclusive residential areas of Lugano, the beautiful Collina d’Oro. It is set in a quiet and sunny setting and the TASIS American School is within walking distance. The cozy villa has a living area of approx. 425 m2 and has approx. 150 m2 of accessory rooms. The beautiful flat terrain guarantees a lot of privacy and has a total surface area of approx. 1'050 m2. The villa consists of: entrance hall, large living room with fireplace and access to a beautiful porch, dining area, spacious well-equipped kitchen, 5 bedrooms, guest/personnel bedroom, 5 bathrooms, guest bathroom, panoramic terrace, beautiful indoor swimming pool overlooking the garden with shower and dressing room, wine cellar, laundry, cellar/storage rooms and technical rooms. The property is completed by 4 parking spaces in the garage and 4 outdoor parking spaces. Delicious garden with beautiful plants. Spacious and comfortable villa in high and dominant position in the countryside and located in an exclusive residential area. According to the zone plan area building regulation it is possible to enlarge the gross living area of approx. additional 284 m2. The villa consist of: entrance area, large living room with fireplace and access to the lovely veranda, dining area, equipped kitchen, master bedroom with en-suite bathroom and two more bedrooms with a bathroom. On the lower flower there is an independent 2,5-room apartment and the service rooms. Have a look at this new offer! 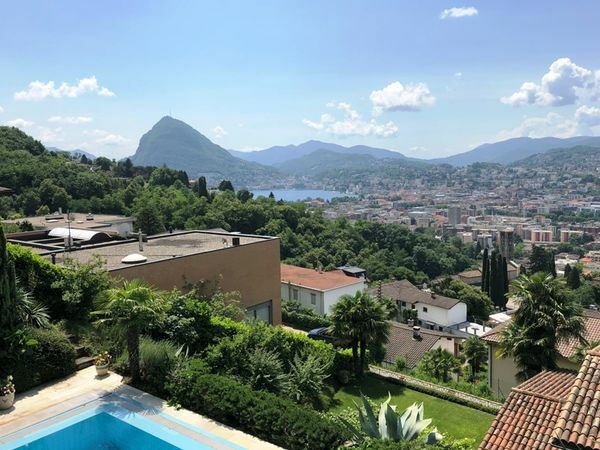 New and exclusive villa with swimming pool located in a wonderful, quiet and panoramic position on the Monte Brè, one of the most beautiful and prestigious residential areas of Lugano. The view from the villa is unique, going from the bay of Lugano, to the city and far until the Alps. The villa has a living area of about 325 m2, a roof garden of about 150 m2 with a Jacuzzi pool and some service rooms for additional 130 m2. The size of the plot is 740 m2. On the main floor you have two entrance areas (internal and outside), a large living room, the open and well-equipped kitchen with wine cellar and a guest bathroom. In the sleeping area, there is a master suite with a bedroom, a walk-in closet and a private bathroom, two more bedrooms with their own bathrooms and a relaxation/study area dividing the two parts of the floor. In the lower floor, there is a fitness area, a bedroom for staff, a laundry and the technical rooms for the swimming pool and the heating. Wonderful Art Nouveau villa surrounded by a gorgeous park with old trees, situated in a very convenient and central location but in a quiet area with only a little traffic. This unique property is distinguished by many original and very well preserved and renovated architectural characteristics: beautiful wooden floors, decorated and painted ceilings, large leaded windows, grand marble staircase, fireplaces, etc. The villa has been completely renovated and is technically in perfect conditions (technical facilities, AC, etc.). Currently the villa serves as prestigious company headquarters and in the upper floor there is an elegant 3,5-room attic apartment. 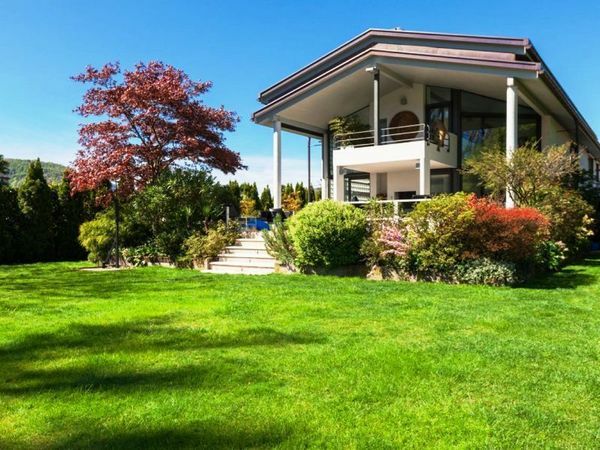 This magnificent property can also be utilized as an elegant private house. The total living area is about 660 m2 split on four floors, connected by an elevator. 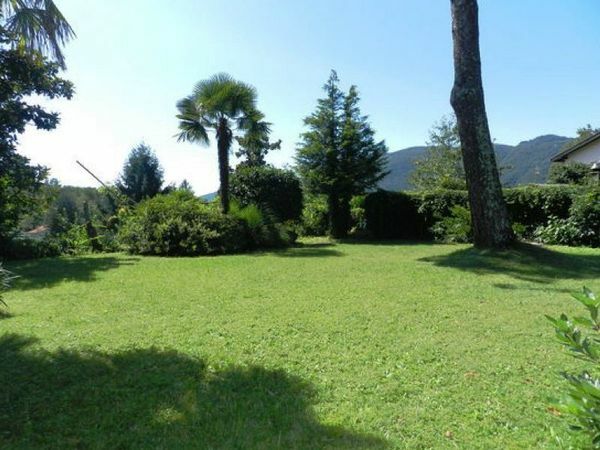 The beautiful plot has a size of 1’800 m2 with large lawns. Ample garage for three cars and spacious backyard with many parking lots. 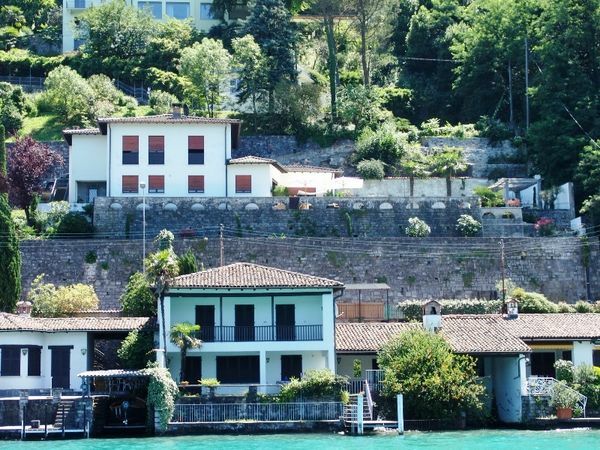 Charming 2,5-room-penthouse apartment with independent annex studio, a wonderful lake view and situated in a quiet location, at the border of the former picturesque fishermen’s village of Morcote. The apartment is located in an elegant residential complex with a beautiful outdoor swimming pool. The living area about is 80 m2 with a lovely covered terrace of 12 m2. Gorgeous living room with panoramic window, well-equipped kitchen, spacious bedroom with luxurious en-suite bathroom. Furthermore, there is a cellar and it is possible to buy a parking lot in the garage. All the floors and the bathroom are decorated in precious travertine. 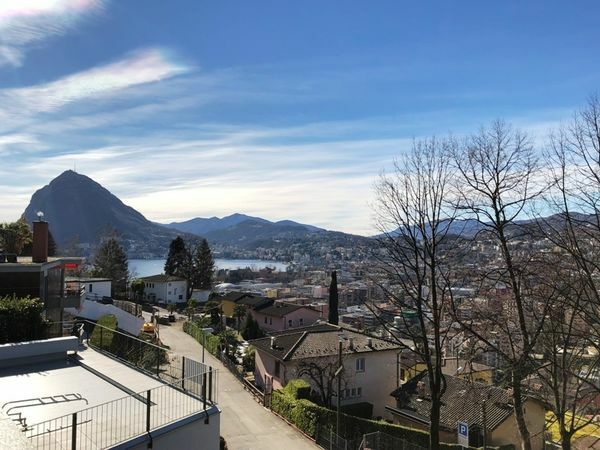 Beautiful villa signed by a renowned Ticinese architect located in a wonderful and panoramic position, with open views upon the city of Lugano, the lake and the surrounding mountains. Large windows allow the light to lighten up all the rooms creating a cozy ambience. The living area is about 390 m2 and the plot has a size of almost 1’500 m2. The villa consists of: entrance area with coatrack, beautiful living room with a stately fireplace, a second living room with dining area, panoramic terrace, spacious eat-in kitchen, master bedroom with walk in closet and en-suite bathroom, three more rooms, a study/library, two bathrooms, guest bathroom, fitness area with sauna and shower, large temperature-controlled cellar/pantry, laundry and technical room. The splendid garden is well looked after. Garage for three cars and two outdoor parking lots. 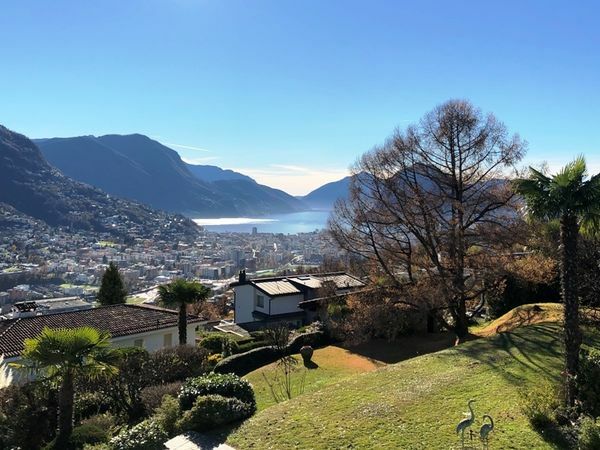 Elegant villa situated in a marvellous location, with a spectacular view upon the bay of Lugano, the city and the surrounding mountains through to the Alps and Mount Rosa. The building is in excellent conditions and has been renewed only two years ago with high-end building materials and introducing modern technical solutions (solar panels, domotics, etc.). A wondeful panoramic elevator connects every floor of the house. The living area is about 270 m2 (+ about 80 m2 of storage and service rooms) and the total area of the plot is 600 m2. Beautiful living room with breath-taking views, well equipped kitchen, lovely terrace with veranda, master bedroom with walk-in closet and en-suite bathroom with jacuzzi, 3 more bedrooms with 3 bathrooms, guest bathroom, sauna, heated outdoor swimming pool, storage and service rooms, garage for 2 cars and 1 parking lot. The beautiful garden has an irrigation plant and provides privacy and tranquillity. 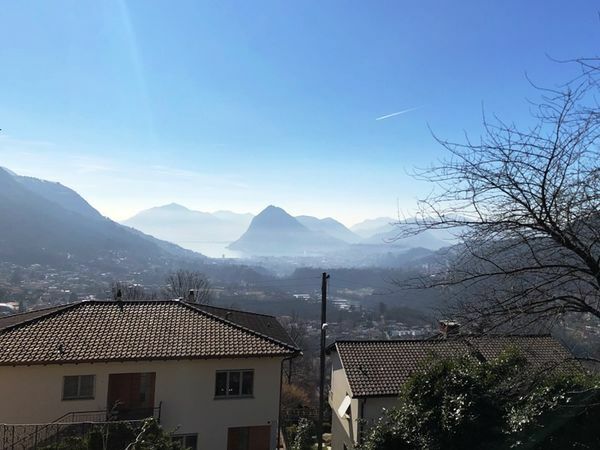 Beautiful and valuable building plot located in a fabulous panoramic position with magnificent views upon the bay of Lugano, the city and the surrounding mountains. The plot has much privacy due to its dominant location in an exclusive residential area and the view is absolutely unobstructable. Currently on the plot of about 700 m2 there is a house which could be either replaced or enlarged: the building regulations allow a maximum living area of 332 m2. It’s a unique and rare opportunity, not to be missed. Large building plot located in an exclusive and precious residential area, very quiet and sunny and at the end of a private access road. The spectacular views run over the lake, the city and the surrounding hills. Encircled by spacious gardens and parks but yet close to all major services in the proximity, the plot has a total area of approx. 3’352 m2 (partly woodland) and it is possible to build approx. 2’224 m2 of gross living area. There is an unofficial project with six duplex apartments with sizes of 205 m2, 167 m2, 114 m2 and a SPR area. 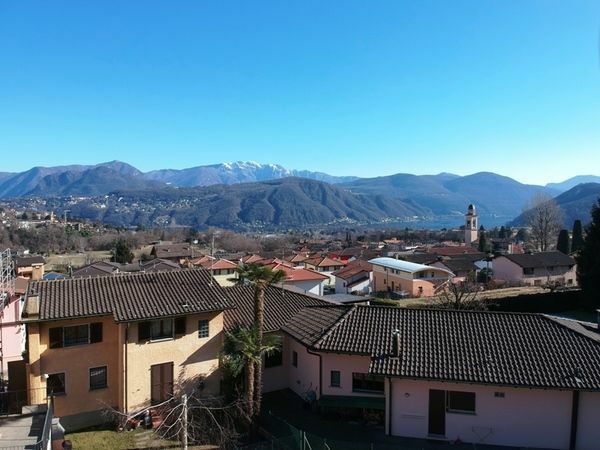 Spacious property with annex building and swimming pool in a wonderful panoramic location on Monte Brè and with a breathtaking view over the lake until the far away Alps. The partially renovated main building is spread on 4 floors connected by a lift. The living area is approx. 420 m2 plus approx. 135 m2 of service rooms (laundry, cellars, technical room, etc. ), moreover there are approx. 90 m2 of beautiful terraces. The annex building has 2 floors and approx. 130 m2 of living area plus approx. 20 m2 of service rooms and an approx. 20 m2 large terrace. The plot has a size of approx. 1’240 m2 and in the nicely planted garden there is a beautiful heatable swimming pool. In the course of a renovation, there are many possible utilization options for this property: as a large single-family villa with an annex or the division in different living units. Enchanting villa with a large park and located in an exclusive residential area, at the end of a small private road. The splendid views run over the lake, the city and the surrounding hills. In 2007, the villa has undergone renovation works, it has a living area of approx. 320 m2 and the plot has a total size of approx. 3’350 m2 (partly woodland). The villa consist of: entrance area with coat wardrobe, double living room with fireplace and high ceiling, dining area, large covered terrace, equipped kitchen, five bedrooms, study, porch, two bathrooms, two guest bathrooms, laundry, four cellars/storerooms, technical room and outdoor storage room. It is possible to enlarge the gross living area of additional approx. 750 m2. 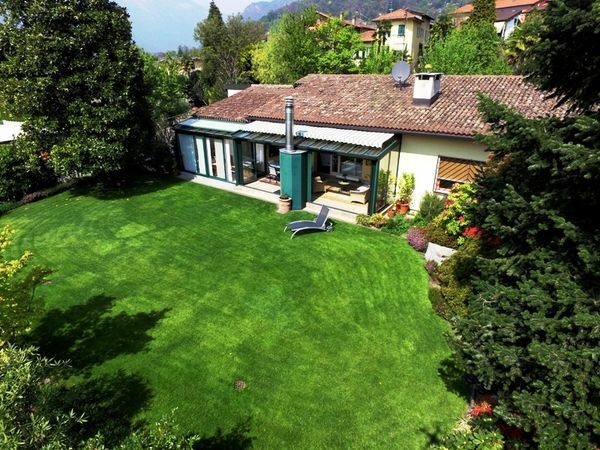 Modern and bright villa positioned in one of the most prestigious and exclusive residential locations of the Lugano area, close to the American school TASIS. The location of this wonderful villa allows great views until the lake. The already approved project considers the building of a design villa with a living area of about 720 m2 spread on four floors, connected through an elevator. The size of the plot is about 1’038 m2 and the utilized materials and finishing will be high-end, natural and luxurious and provided with the latest technology. There will be a central garden/patio with a swimming pool and access to most rooms. The estimated completion time will be two years. 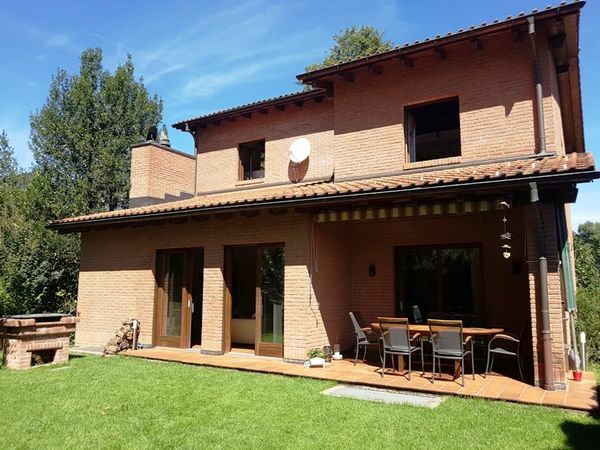 Comfortable villa in the countryside, located in an idyllic, quiet and sunny residential area at the border of the built-up zone and close to all main services (public transportation, schools, tennis courts, etc.). The cozy home has lovely brick facades, a total area of approx. 390 m2 and the size of the plot is approx. 500 m2. The villa consists of: entrance area with coat rack and guest bathroom, beautiful living room with a large marble fireplace and high wooden ceiling beams, dining room, spacious and well-equipped kitchen, covered porch with access to the garden, master bedroom with spacious gallery/study and a luxurious marble en-suite bathroom with Jacuzzi and shower, three more bedrooms (one with a gallery/play area), two bathrooms, second living room with a nice fireplace and fittings for a potential kitchenette, laundry, cellar, storeroom and technical rooms. Garage for two cars and outdoor parking space. 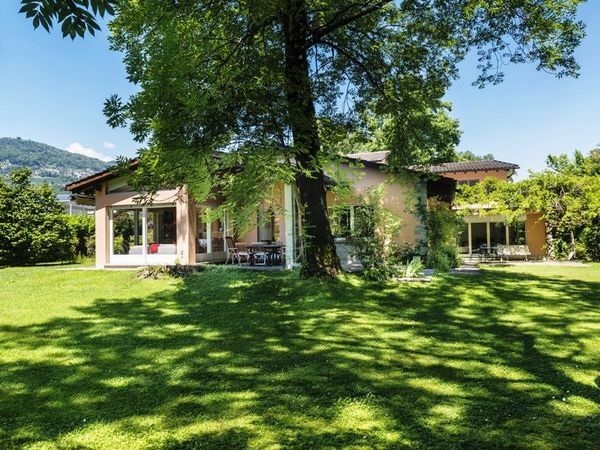 Beautiful villa from well-known architects with a 2'001 m2 large plot of land, situated on an slightly elevated and very sunny location in the enchanted village of Arosio, only 15 minutes from Lugano. This house is a jewel of the so-called and internationally successful architectural movement known as the “Tessiner Schule”. The villa has a living area of about 280 m2, in addition there are about 50 m2 of service rooms and about 100 m2 of accessible attic space. It consists of: living room with balcony, dining area with large fireplace and high ceilings, eat-in kitchen, 5 bedrooms with balcony, a study area, 3 wardrobe rooms, 4 bathrooms, a spacious hobby/fitness room, a temperature-controlled wine cellar, a cellar/storeroom, the laundry and 2 large attics. The property has a beautiful and partially flat garden, 2 covered parking lots and a yard with several unroofed parking lots. 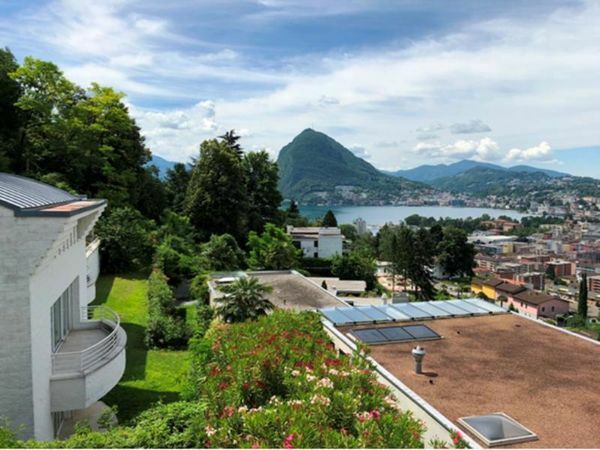 Beautiful villa built in traditional Mediterranean style, located in a marvelous panoramic position above the lake, with spectacular 180°-view upon Lake Lugano and the mountains. The 250 m2 living area is split on two levels and the lovely, terraced garden has a total size of about 750 m2. The villa has been recently renewed with excellent finishing and is in very good conditions. It consists of: entrance area, large living room with dining area and fireplace, terrace, well equipped kitchen, three bedrooms, study/guest room, two comfortable bathrooms, laundry, storage room and technical room. From almost all rooms you have wonderful views upon the lake. In the manicured garden, there is a scenic and heated granite swimming pool, a romantic pergola and an irrigation plant. Garage for one car and two parking lots. 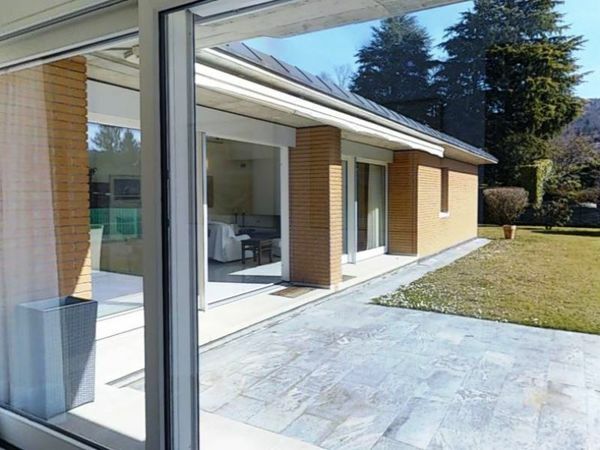 Modern new villa with wonderful views upon the lake, the city of Lugano and the beautiful surrounding mountains. The property is located in a picturesque and quiet part of the city called Aldesago on Monte Brè and the city is easy-to-reach within a few minutes. The villa was built in 2015 with high-end finishings and has a living area of about 300 m2 plus about 50 m2 of service spaces. The plot is partially wooded and has an area of about 1’700 m2. The villa consists of: spacious living room, well-equipped kitchen by Poliform, master bedroom with very large walk-in closet and ample en-suite bathroom with Jacuzzi and shower, three more bedrooms with three bathrooms, storeroom/cellar, laundry and technical room. The villa has moreover several terraces, a swimming pool, a scenic 55m2-large roof garden, a garage for two cars and two parking lots.